The Ultimate Breaks & Beats series is a collection of some of the most sampled breaks ever compiled from music released during the 1960s, 70s, and 80s. The series has been done and redone; released and re-released several times. Up until now, these songs were never available as purely instrumental only and producers have been forced to work around the grunts, screams, and crooning of these classics to isolate that perfect drum beat, breakdown, or sample. Previously, Traffic Ent. 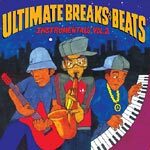 Group brought us the El Michael's Affair interpretations and now Mr. Chop and Friends produced Ultimate Breaks & Beats Instrumentals Volume 2 with added bonuses including three UBB influenced break interludes. An interesting new take as well as being very listener, DJ, and producer friendly.